We recently did a reroll in my campaign and moved over to a new country that my players are mostly unfamiliar with. That means a lot of the stuff that I’ve been working on in the background has suddenly become available and I’m now scrambling to finalize a lot of it. In the process, I’ve come up with this take on the Sorcerer class, and I wanted to share. I find him interesting, spontaneous, and random. Truly a match for any experienced arcane caster to wrangle with the possibilities. The Sorcerer is unique in many ways as a wielder of arcane power. Their channeling of magic comes more through the force of willpower and their own physical toughness than any intellectual aspirations. Because of their strange methods of channeling, they receive a d6 for hitpoints each level instead of a d4 like other arcane casters. They do not have the mental acuity or patience for deep thoughtful study of magic, and are instead granted spontaneous access to spells through odd, nonsensical rituals, or just the force of their own willpower. Similar to the Barbarian class, a player can only select the Sorcerer class at first level. The powers granted here are generally something stumbled upon at a young age and have nothing to do with learning or practice. However, with the help of divine powers, or the aid of a Wish, anything is possible. The Sorcerer receives spells, and their power, mostly at random. 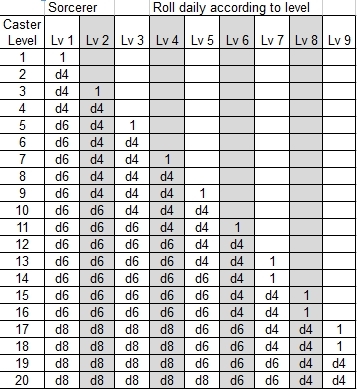 The number of spells a Sorcerer is able to cast is determined using the chart below. Bonus spells from a high Willpower score are allowed as normal. The randomness of their daily spells reflects the “come what may” attitude and fluctuations in power of the Sorcerer. They have little in the way of absolute control over their powers, and learn to live with what they get. 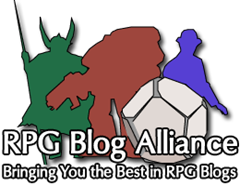 They are able to use this varying amount of power to cast any spells they have learned thus far, which brings up the second bit of randomization. Sorcerers, upon attempting to learn a new spell be it from scroll or by teacher, roll four random spells of the same level and select one of those instead. For Wizards, upon learning a new spell, they absorb or figure out how to unlock specific energies. For a Sorcerer, they open a door, and whatever it is behind that door, finds them instead. The Sorcerer also comes with a significant disadvantage to spellcasting, much like a Mage does. Although they may carry around a book with notes on their powers, they are not required to carry around a spellbook and recite highly specific verbiage. The Sorcerer instead requires a highly disruptive or unsettling trait in order to drum up the arcane energies in a specific way. For some Sorcerers this is something natural to them that they’ve always done, or don’t realize is happening. For others, they may have developed an odd compulsion to a specific behavior years ago and it assists them in channeling their magical energies today. For example, the eyes of the caster going completely black and the blood in the veins of the casters face turning dark would be sufficient for an unsettling trait, whereas using the severed and preserved head of a goat to speak gibberish through could be an odd compulsion they’ve been drawn to over time. Encourage your players to get wildly creative with this, and incorporate it into situations where it can be exploited.